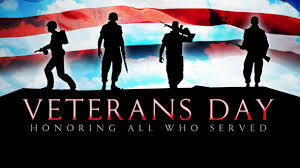 As a veteran, I want to say: Happy Veterans Day to every veteran who is serving and has served with honor! Your sacrifice is well worth noting and for that, we say THANK YOU!! You’re welcome, it’s my honor! You’re so welcome! I’m extremely grateful for those who have served before and those who are serving now. Especially those who gave the ultimate sacrifice! Thank you for your service. My husband and I were both Navy. Where did you serve? You’re welcome Julie and thanks to you and your husband as well! I served in the Army in several stations in the States and in Germany. thank you for your service… I was a navy wife for almost 21 years… now, I’m a retired navy wife, I thank my vet hubby all the time for the sacrifices he made in his career. You’re welcome DAF and thank you and your husband as well! I believe a sacrifice is made by the family of any service-member. May God strengthen you today for the assignment He has for you! God bless you and thank you for serving us! You’re welcome Debbie and Blessings to you as well! …and thank YOU for your service! You’re welcome sir…I appreciate that! You’re so welcome…I appreciate that! And so are you, Happy New Year! Thank you my Sister and Happy New Year to you as well! Blessings!